While many are talking about how athletes took a seat on the ice or on the slopes Thursday, a lot of people are still busy talking about where they actually sat. One of the biggest stars of the Olympics after the first week appears to be the set of chairs seen at the end of the moguls run and cross-country courses. Nicknamed the "The Futon of Failure" and the "Cast-Off Couch", the onus of being kicked off of the comfy environs provided by the oversized chairs appeared to match the drama provided in the runs themselves. 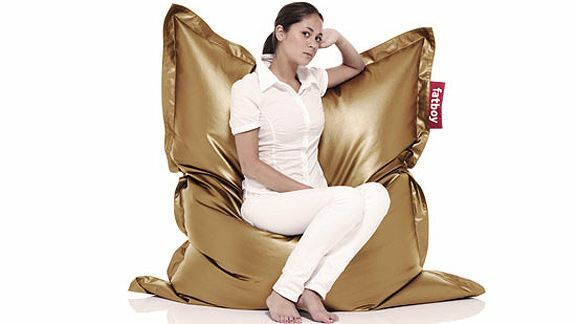 So do these cushiony chairs represent a postmodern medal stand for a generation of couch potatoes? We sat down with Paula Masters, President of Fatboy USA, makers of the iconic comfy chairs, to discuss the armchair phenomenon. Page 2: How did Fatboy get involved with the Games? Masters: We approached Vancouver organizers over a year ago and they bought a number Fatboys which they placed at various venues and events. Many can also be seen throughout Olympic Village and we even provided them with special gold, silver and bronze "Metahlowskis" which we hope will get used as well. Page 2: With what other sporting events has Fatboy been involved? Masters: Well, we have outfitted Jerry Jones' suite at the new stadium and decked out the Nike Lounge at the Super Bowl. Page 2: Do you see Fatboy unseating traditional sports chairs like the sideline stools seen in boxing rings or the umpire chairs at tennis matches? Masters: (laughing) Interesting ideas. We are definitely investigating other venues and ways in which our product can be showcased and used. Right now we feel it is perfect fit for gamers as they are comfortable and flexible ... as well as for football and other sports fans. Page 2: The beans in bag chairs of the 1970s were know to sprout if they happened to get wet. Do your beanbag chairs have a problem being in the wet weather of Vancouver? Masters: The beanbags of yesteryear did have problems, but our outdoor products are made of a heavy polyester material that can withstand rainfall and other inclement weather situations. Plus we make our models out of virgin beans so we are cool ... we are covered in that respect. Page 2: Speaking of virgins and being covered, it was announced Thursday that 100,000 condoms had been dispersed to athletes in the Olympic Village. Given that your comfy chairs are omnipresent throughout the village, how do you think they would hold their own in athletes' "after-hours training sessions"? Masters: No comment ... but hey, they are comfortable.